A The term "TV addiction" is imprecise, but it captures the essence of a very real phenomenon. Psychologists formally define addiction as a disorder characterized by criteria that include spending a great deal of time using the thing; using it more often than one intends; thinking about reducing use or making repeated unsuccessful efforts to reduce use; giving up important activities to use it; and reporting withdrawal symptoms when one stops using it. B All these criteria can apply to people who watch a lot of television. That does not mean that watching television, in itself, is problematic. Television can teach and amuse; it can be highly artistic; it can provide much needed distraction and escape. The difficulty arises when people strongly sense that they ought not to watch as much as they do and yet find they are unable to reduce their viewing. 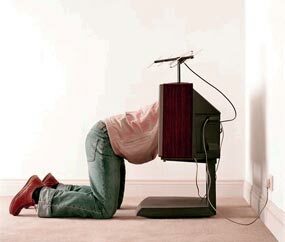 Some knowledge of how television becomes so addictive may help heavy viewers gain better control over their lives. C The amount of time people spend watching television is astonishing. On average, individuals in the industrialized world devote three hours a day to the activity – fully half of their leisure time, and more than on any single activity except work and sleep. At this rate, someone who lives to 75 would spend nine years in front of the television. Possibly, this devotion means simply that people enjoy TV and make a conscious decision to watch it. But if that is the whole story, why do so many people worry about how much they view? In surveys in 1992 and 1999, two out of five adults and seven out of ten teenagers said they spent too much time watching TV. Other surveys have consistently shown that roughly ten per cent of adults call themselves TV addicts. D To study people’s reactions to TV, researchers have undertaken laboratory experiments in which they have monitored the brain waves, skin resistance or heart rate of people watching television. To study behavior and emotion in the normal course of life, as opposed to the artificial conditions of the laboratory, we have used the Experience Sampling Method (ESM). Participants carried a beeper*, and we signaled them six to eight times a day, at random, over the period of a week; whenever they heard the beep, they wrote down what they were doing and how they were feeling. E As one might expect, people who were watching TV when we beeped them reported feeling relaxed and passive. The EEG studies similarly show less mental stimulation, as measured by alpha brain-wave production, during viewing than during reading. F What is more surprising is that the sense of relaxation ends when the set is turned off, but the feelings of passivity and lowered alertness continue. Survey participants commonly reflect that television has somehow absorbed or sucked out their energy, leaving them depleted. They say they have more difficulty concentrating after viewing than before. In contrast, they rarely indicate such difficulty after reading. After playing sports or engaging in hobbies, people report improvements in mood. After watching TV, people's moods are about the same or worse than before. G Within moments of sitting or lying down and pushing the "power" button, viewers report feeling more relaxed. Because the relaxation occurs quickly, people are conditioned to associate viewing with rest and lack of tension. The association is positively reinforced because viewers remain relaxed throughout viewing. H Thus, the irony of TV: people watch a great deal longer than they plan to, even though prolonged viewing is less rewarding. In our ESM studies the longer people sat in front of the set, the less satisfaction they said they derived from it. When signaled, heavy viewers (those who consistently watch more than four hours a day) tended to report on their ESM sheets that they enjoy TV less than light viewers did (less than two hours a day). For some, a twinge of unease or guilt that they aren't doing something more productive may also accompany and depreciate the enjoyment of prolonged viewing. Researchers in Japan, the U.K. and the U.S. have found that this guilt occurs much more among middle-class viewers than among less affluent ones. I The orienting response is an instinctive reaction to any sudden or new, such as movement or possible attack by a predator. Typical orienting reactions include the following the arteries to the brain grow wider allowing more blood to reach it, the heart slows down and arteries to the large muscles become narrower so as to reduce blood supply to them. Brain waves are also interrupted for a few seconds. These changes allow the brain to focus its attention on gathering more information and becoming more alert while the rest of the body becomes quieter.